Il Sorpasso (The Easy Life) is a ferociously entertaining film that is both masterful and thought provoking. Directed by Dino Risi, Il Sorpasso stars Vittorio Gassman as Bruno and Jean-Louis Trintignant as Roberto. 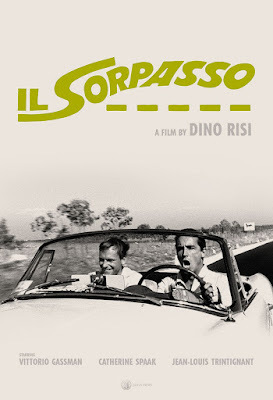 Nick Vivarelli of Variety referred to Risi as, “An undisputed master of Italy’s postwar commedia all’italiana.” Il Sorpasso demonstrates this sentiment beautifully. On the surface, Il Sorpasso is a comedy about a road trip shared by two entirely different strangers. Meanwhile, the film is also deeply tragic, and it provides a reflection of cultures past and present. Bruno is the driving force of the film from the beginning to the end. He is wild and unrestrained. Responsibilities are the furthest issues from Bruno’s mind. Instead, Bruno lives in every moment with excitement and wanton disregard for consequences. He charges through life and the Italian landscape in a peppy little convertible with reckless abandon. However, Bruno’s actions and carelessness eventually result in the tragic death of Roberto. While Bruno represents a man attempting to transcend his age and a special brand of overcharged masculinity, Roberto is different. Roberto is quiet and reserved. He is ordinary and represents the traditional values of Italian men and families (Candela). From the onset of the film, Bruno makes Roberto nervous, and he is uncertain of Bruno’s intentions. Although Roberto is uncomfortable in the beginning, he eventually begins to relax and gives into Bruno’s influence. The juxtaposition between Bruno’s fun-loving personality and Roberto’s sheltered nature provides an organic humor. 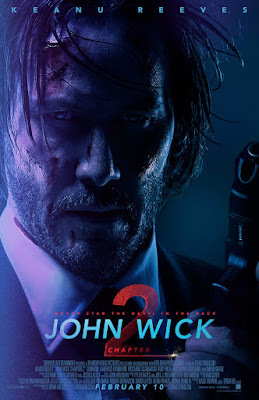 The film is a highly entertaining comedy, yet it is also a cautionary tale about economic prosperity and a man that lives without prudence (Powers). While Il Sorpasso is a depiction of Italy in the 1960s, the film’s humor and themes transcend geographical borders and time. One of the most essential ingredients of Il Sorpasso is Vittorio Gassman’s performance. Gassman is brilliant as Bruno. Bruno not only convinces Roberto to ride in his car, but also yanks the audience into the passenger seat. Although we are also uncertain of Bruno’s motives and question his level of self-control, we cannot help but join him on his journey. While Bruno provides a representation of problematic masculinity manifested onscreen as a lunatic in a convertible, he is also fun, exciting, and infectiously charming. We see through Roberto that Bruno is not only a potentially dangerous man, but also a lovable boy trapped in a man’s body. When necessary, Gassman seamlessly flows in and out of moments of hysterical comedy and the layers of turmoil that reside within Bruno. Bruno is over the top and out of control, but Gassman’s performance in Il Sorpasso is nuanced and refined. The nuances and refinement found in Gassman’s performance harmoniously echo Dino Risi’s directing. Risi’s emphasis on detail is striking. Every frame of the film seems to come alive with subtly and superior composition. Bruno is wild and energetic, but Roberto is calm and restrained. Risi’s directing style demonstrates the same type of relationship. Risi balances each of these forces with control and elegance. Risi can be loud and over the top, yet much like Roberto, he remains in the background in quiet contemplation when necessary. The framing of the characters and the landscape of the film are accomplished with precision. Everyone and everything in the camera’s lens is carefully constructed, and Risi gives purpose to both the central characters and the extras. Risi’s extras are almost just as important as the central characters of the film. By drawing our attention to these branches of reality and alternate modes of existence, Risi adds a depth that assists in bringing the film alive. These details not only provide the audience a greater sense of the world that surrounds Bruno and Roberto, but also a unique perspective of Italy during the postwar economic boom (Lopate). From the moment the film opens, Risi captivates the audience with visually striking landscapes. A lively jazz soundtrack blares through the psyche. Although the streets of Italy are mostly empty, Bruno and his convertible fill the landscape with energy and excitement. The tone of the film is carefully set. 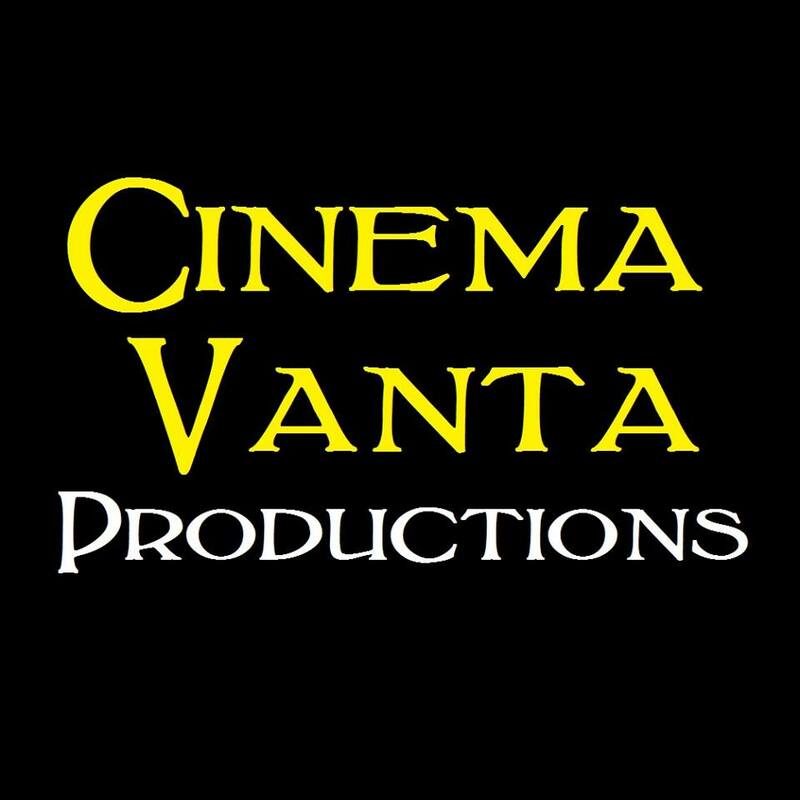 When Bruno stops the car outside Roberto’s home in the beginning of the film, the audience becomes a passenger before Bruno and Roberto meet. Bruno and Roberto are strangers, but Bruno’s overbearing and outgoing personality instantly engulf Roberto’s existence. Upon meeting one another, Bruno asks Roberto to call a woman that is waiting for Bruno. Instead of calling the woman for Bruno, Roberto invites Bruno to use his phone. Roberto is timid and reclusive. He wants to be alone to study, but Bruno quickly convinces Roberto to take a drive in the convertible. Bruno’s driving is erratic and dangerous. He roars through the Italian landscape, furiously honking his horn, and teasing everyone that he passes. While Bruno mocks everyone that he passes, Risi mocks Bruno’s machismo and masculinity throughout the entire film. Despite the comedy that Risi uses to poke fun at his characters and Italy, a deep affection for the characters and country is apparent in Risi’s work. As Bruno and Roberto drive from town to town, Bruno is never in short supply of sarcasm and practical jokes. He plays jokes on Roberto, the people he meets, and other cars on the road. At first, Bruno’s behavior and bravado make Roberto uneasy, and he questions whether he should continue to engage in the car ride with Bruno. However, eventually Roberto warms up to Bruno, and it is apparent that Roberto admires Bruno. Bruno’s overbearing personality lures Roberto into Bruno’s way of life. Bruno charges through the world with the carefree nature of a child. While Bruno is uninhibited around women, Roberto is shy and nervous around them. However, as he begins to loosen up and enjoy the ride in Bruno’s convertible, Roberto starts to enjoy the simple pleasures of life with Bruno. 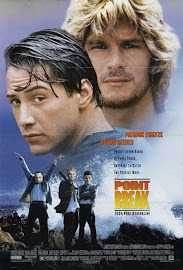 Until the end of the film, Bruno seems without consequence, and he often slips away from danger and authority unscathed. Bruno seems unstoppable until a car crash on the side of the road prompts him to pull over. A dead body lies on the side of the road. Instead of taking the serious nature of the car crash to heart, Bruno remains sarcastic, opportunist, and flippant. He attempts to capitalize on the situation by soliciting a crying truck driver for the merchandise damaged in the crash. However, a police officer quickly interrupts Bruno by honking the convertible’s ridiculous car horn. The police officer writes Bruno a ticket for his reckless driving. Despite the officer’s citation and the foreshadowing implored by a dead body on the side of the road, Bruno remains obnoxious. Bruno begins mocking the police officer, but he is quickly back on the road racing through life more carefree than ever. Throughout the film, it often seems as though there is no stopping or slowing down Bruno. His vibrant energy never falters. Until we learn the Bruno has a wife and daughter, it seems that Bruno has led an entirely laid-back and untroubled life. However, as Bruno’s estranged wife Gianna reveals to Roberto, Bruno has struggled to find his place in the world. Underneath the seemingly happy-go-lucky and brash exterior of Bruno, resides a lonely boy that never matured. In fact, Bruno’s teenage daughter Lilly is more mature and self-controlled than Bruno. Once Lilly and Gianna are introduced, it is clear that the lifestyle Bruno leads and the unfaltering masculinity that he clings to have already resulted in negative consequences. It is obvious that Bruno has been absent for the majority of Lilly’s life. Meanwhile, it is apparent that Lilly loves and cares for Bruno, but Lilly generally uses Bruno’s first name when talking to him. She sees Bruno as more of a friend than she does a father figure. In the middle of the night, Bruno and Roberto arrive at Gianna’s house drunk. Shortly after their arrival, Lilly’s boyfriend Bibi escorts her home. Bibi is significantly older than Bruno, and Bibi’s age upsets Bruno. However, Roberto offsets Bruno’s frustration by drunkenly laughing at the situation. The presence of Bibi, and Lilly’s plans to move to America with Bibi, mark the point in which Bruno finally begins to question and evaluate the choices that he has made in life. Lilly’s relationship with Bibi is an obvious representation of a young girl seeking out the male role model and fatherly structure that Bruno neglected to provide Lilly in her formative years. Meanwhile, Lilly’s relationship with Bibi is not a manifestation of malice or passive aggressive vengeance. Bruno regrets not being a better father to Lilly and a more responsible person in general. However, when Bruno confides in Lilly, Lilly tells Bruno that he should never change. She cannot help but love Bruno and his vivacious attitude toward life. Nonetheless, Bruno’s unfaltering reckless behavior ultimately causes Roberto’s death. After a brief respite at the beach, Bruno and Roberto decide to end their road trip. Bruno is just as careless and fearless as even while driving home. 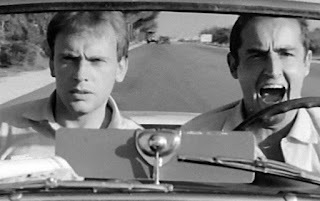 Despite Roberto’s fear and uncertainty of Bruno’s reckless driving in the beginning of the film, in the end, he relishes in the excitement of speeding through the Italian landscape. Now, both Bruno and Roberto are screaming and wailing down the highway like two teenagers on a joyride. 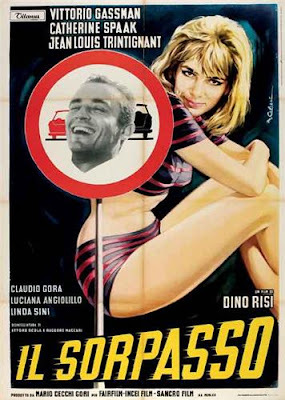 As Bruno attempts another il sorpasso (the suiting title and Italian term for aggressively passing another vehicle,) he drives the convertible into oncoming traffic, and a semi-truck drives straight at the convertible (Lopate). Bruno swerves the car away from a semi-truck. He loses control of the car. The car smashes into a cement barricade. The impact of the crash throws Bruno from the car as it tumbles down a cliff. Roberto remains in the passenger seat as the car falls, and he plunges to his death. While Il Sorpasso is a highly entertaining comedy, it is also a deeply tragic film. It is not only a social critique about Italian males and the economic boom of postwar Italy, but also a warning (Powers). Despite the excitement inherent in Bruno’s vibrant and arrogant personality, his carefree lifestyle results in detrimental consequences. Bruno embraced a frivolous and superficial lifestyle, and he can only blame himself for missing his child’s life and the death of Roberto. Additionally, the film serves as a reflection of a culture and a society that Risi saw as speeding recklessly out of control trying to breeze by anyone or anything it passes (Lopate). 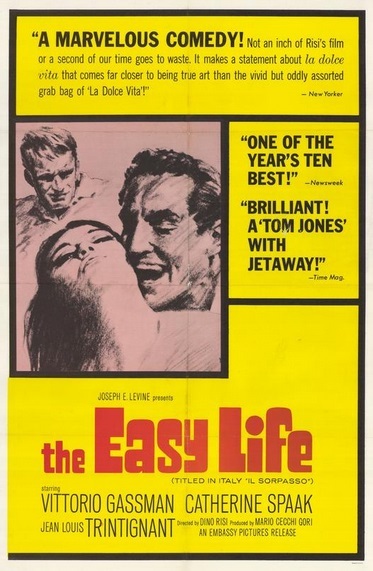 The film warns that life can be thrilling and fun. However, when we stop paying attention to that which we care about and lose sight of ourselves, tragedy waits down the road. and Literature building, Tempe, AZ. Oct. 2015. Lecture. Il Sorpasso. Dir. 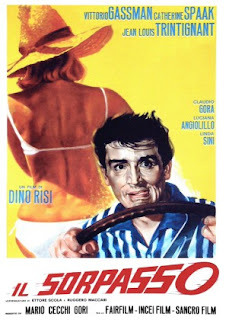 Dino Risi. Perf. Vittorio Gassman and Jean-Louis Trintignant. Criterion, 2014. Vivarelli, Nick. “Dino Risi.” Variety 11 June 2008: 16. Print.